Like many things with Windows 10, Microsoft is leaving consumers and the tech industry in the dark about key features and functionality. You no longer get Windows Update breakdowns, non-genuine Windows licenses can upgrade to Windows 10, and even Windows 10 activation is somewhat clouded. That is until today. 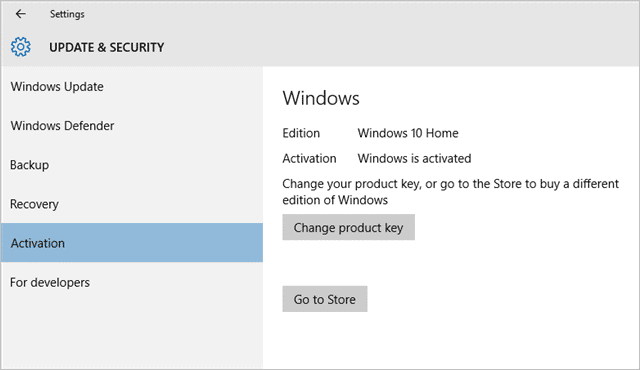 Microsoft has broken down how Windows 10 activation will work for a variety of situations. If you’re wondering how your free upgrade affects your Windows license, read on. Entering a product key from a purchase can be via an online order of installation media. You’ll even find this product key on the bottom or sides of computers prior to Windows 10’s release. From there, you’re either activated by phone if there’s an issue activating the license via the web. However, with Windows 10’s release, especially the free upgrade, Microsoft introduced digital entitlement. Digital entitlement happens when you upgrade to Windows 10 from a genuinely licensed copy of Windows 7 or 8. You’ll never need to enter a product key again if you need to clean install on the device you upgraded on. Microsoft essentially is writing the Windows 10 key to your BIOS, storing it permanently on your device and not on the hard drive or through the OS itself. Even now, after upgrading to Windows 10, then performing a clean install, you’ll find a handy little “Skip” button where you’d typically enter a product key. This is because the Windows installation sees in your BIOS you’ve already upgrade and have a genuine Windows 10 license key. If you need to swap out, or install a new, motherboard, you will have to call Microsoft to extract and/or transfer your license key to the new component. There’s still issues that may pop up where you’ll have to call to verify your Windows 10 installation in the future, just like with any previous version of the OS. However, as long as you have proof of purchase of the original computer and/or license key from a earlier version of Windows, this process is relatively easy. You can read more about Windows 10 activation here at Microsoft’s website. Microsoft is trying to make it easier for consumers to use Windows 10, especially when it comes to clean installs and recovery. By turning towards digital entitlement, they think they can make this easier for everyone. For now, it seems to be a safe bet for consumers who may lose product keys down the line or have other issues with a product key. For others, they feel this is an invasion of their privacy and rights as a license key holder. As usual, Microsoft is surrounded by controversy in how they’re handling Windows 10 license keys.